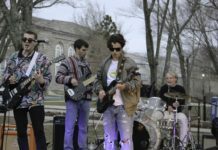 The University of Rhode Island’s student-run television network is planning a relaunch for later this school year. URI TV Network is available on channel 85 on the campus cable system and currently broadcasts a small number of student-created programs. Among these is “Barrett Tonight,” a weekly late night program hosted by the network’s president, senior Barrett Jourdan. Jourdan, a film media major, had experience with stage and comedy during high school and became involved with the network shortly after coming to URI. 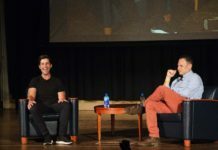 “I actually turned on the channel and I said ‘this is a medium that no one’s really utilizing, what can I do?,’ and I’ve been doing a show every Friday since the second week of my freshman year,” he said. Jourdan’s show follows the regular format of a late night talk show, including a monologue, comedy sketches and guests such as student leaders, stand-up comedians and musicians. “We also do something called ‘Quadversations’ which is when I go to the quad and we film around asking students stupid questions, or we just try to fool around with people and we put it in and that’s a bit,” he said. The other shows on the network include “Nerds of the Round Table,” a panel discussion show that focuses on films, video games and nerd culture and “Black Plague TV,” which Jourdan describes a “music genre, cultural underground program” that highlights local hip-hop and R&B artists. The network recently filmed the first episode of a fourth show, a political program hosted by former student senator Adam Schmuter. When it is not showing new programing, the network airs reruns of older content that is looped throughout the week. According to Jourdan, the URI TV studio and network has been in Chafee since the 1970s, and was revamped in the 1990s. Students can get involved with the network by contacting one of the organization’s leaders and asking for a spot in the channel’s schedule for their program. “It’s run totally on volunteer, so if you’re in here and you want people to run your show with the studio, one of us can be here, or you get other people who are involved in the organization to volunteer and run the studio equipment,” Jourdan said. Students can also produce programs independently from the network and request they be aired. Jourdan said that interested students can contribute by contacting the network and sending them their completed program. The network’s only request is that they include the URI TV Network logo at the bottom of their video. Jourdan said that several alumni of the station have gotten jobs in the industry, primarily in backstage positions, but also said that it has been “underutilized” by those who are planning careers in journalism or broadcasting. The office is utilized by one broadcast journalism class at the end of each semester, but it is otherwise not used by classes. The station’s systems were recently upgraded from standard definition to high definition and switched from an analog signal to digital. In the near future, the network is planning an expansion of its studio space in Chafee. This would include the replacement of paneling that had been donated by WJAR in the 1970s. Jourdan said that the station may get an outside studio during the construction of the new chemistry building. 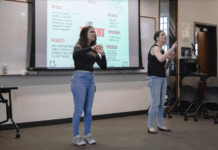 For the remainder of the semester, the network plans to increase its on-campus visibility with a new website and new efforts to promote programming. Aside from the campus television channel, the network’s programming can be viewed on its YouTube page.